I’m sorry my friends. I swore myself to secrecy. I gave my word, to a monk nonetheless, that I would not reveal any specifics or even the hint of the actual location of, perhaps, the best Yakitori that I have ever had. The place is Area 51 with a cadre of regulars who are wildly protective of it. If I broke down and shared the info, I fear some serious karmic and possibly physical retribution would be in my future. So, instead I will just have to speak on it and possibly, some day, if you are here in Tokyo with me, I will take you there under the same strict code of silence. Most great Yakitori that I have been to have been smoky and loud affairs. Not this one. Father, wife and son at the controls. Sumo on the television. No smoking allowed. A few customers came in pairs, but the majority were solo diners who kept conversation to the minimum. This was focused, reverent eating with an awareness of limited seating. It is essentially a Temple devoted to Chicken. And oh…What a chicken. I’m not talking butchering, technique, skills of the grills…I am talking the chicken itself, the bird, the alpha and omega of the poultry arts. This was a pampered animal, flesh juicy and tender with no stringiness at all even in the dense parts of the thigh. The skin layered with rich, golden fat and an overall taste that answered the almost philosophical question: What is Chicken? 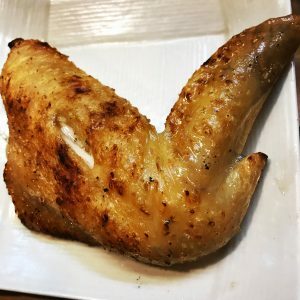 If this chicken appeared in any New York restaurant there would be articles about it in New York Magazine, Eater would list the ways that everyday cooks could snag one, New Yorker would do a six page profile on the man who breeds them. I imagine the chicken to be one of those outrageously cute, poofy-feathered varieties that you see at a 4H fair and can’t really believe exists. This is not a chicken that is bought. This is chicken that has been born out of a long-standing, nurturing relationship between the Yakitori and the Chicken farm. This chef gets only the best. The result is a freshly killed, impeccably clean bird. Each aspect is celebrated: gizzards, hearts, thighs, wings, liver, soft bone, strange “between” cuts that I have never seen before. Everything perfectly grilled, lathered lightly in a sauce that likely has been simmering for fifty years. I have never tasted chicken innards like this. Bursting with flavor, textural yet utterly juicy and tender. A perfect, over-sized wing with crackling skin and rendered chicken fat. And then there was the chicken sashimi. If served in America, you would have to wear a hazmat suit. But there it was…raw chicken breast, silvered green onion and wasabi. It was incredible and a bit beyond description. If pushed, I prefer my chicken cooked, but if I were ever to enjoy a raw bird, this was the place to enjoy — no odd tastes, just a clean, chickeny essence shot through with the bite of wasabi and the lick of soy sauce. I understand the code of silence now. I understand why this yakitori needs to be top-secret. It is just too good, too special to risk it being overwhelmed with everyday customers. If you come with me here, I might just have to blindfold you. If you revealed the location, I might just have to kill you. We have to protect this Yakitori. It is the Yakitori that can not be named. I will submit to blindfolding to experience this. Holy moly.